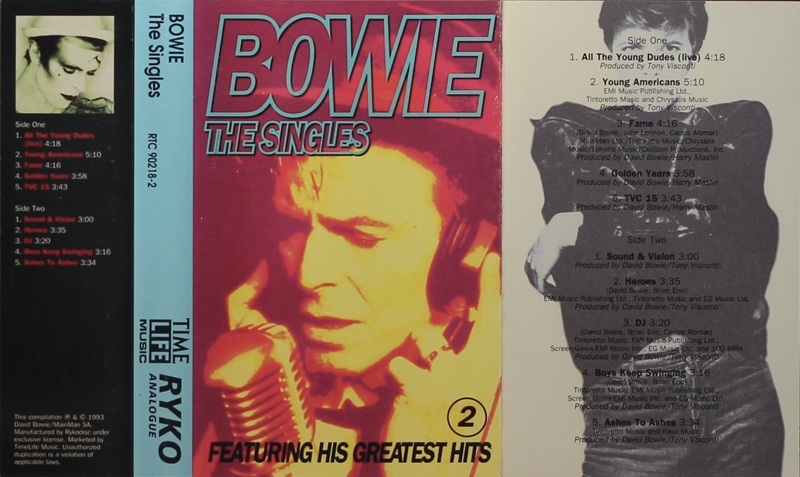 The Singles (1969 To 1993): USA; RYKO, RAC 10218/ 19; 1993. Double album released as two separate cassettes. Six panel cover on thick, treated paper with full panel cover photo; inner picture panels; light blue spine and blue rear panel. Inside and inner picture panels. Track list on inside panels. Round holes in rear panel. Blue ink printed directly to clear shell; plain slip sheet. 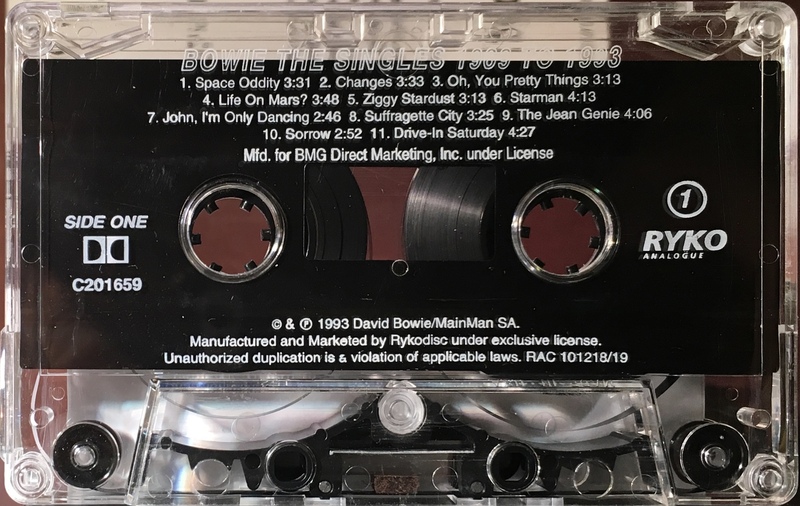 Side 1: Space Oddity; Changes; Oh! 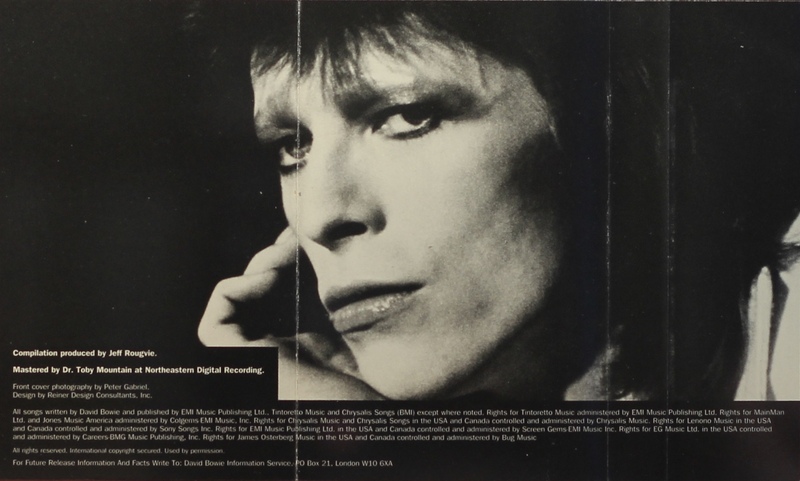 You Pretty Things; Life On Mars? 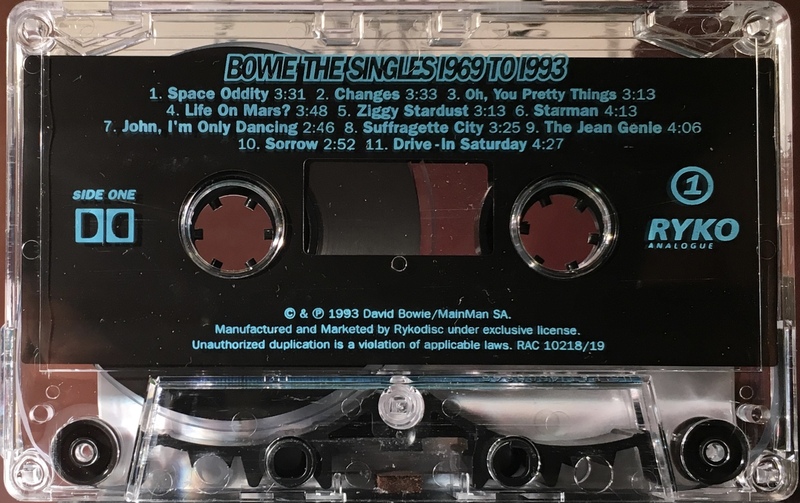 ; Ziggy Stardust; Starman; John I’m Only Dancing; Suffragette City; The Jean Genie; Sorrow; Drive-in Saturday. 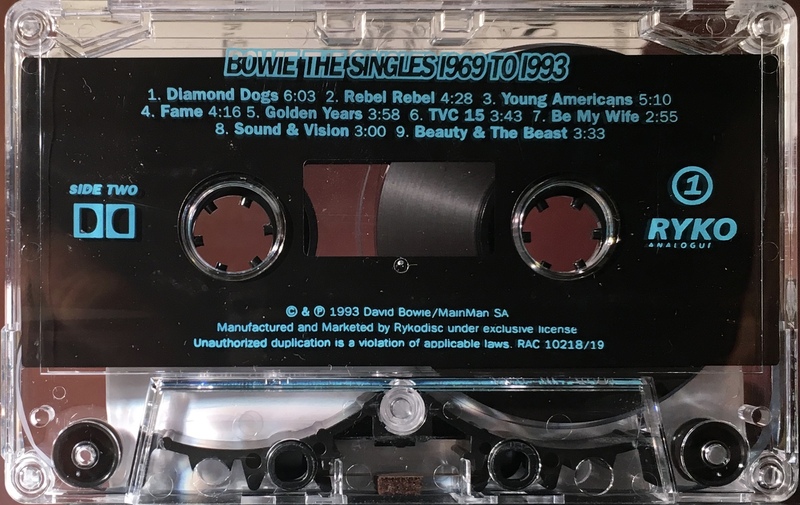 Side 2: Diamond Dogs; Rebel Rebel; Young Americans; Fame; Golden Years; TVC 15; Be My Wife; Sound & Vision; Beauty & The Beast. Double album released as two separate cassettes. Six panel cover on thick, treated paper with full panel cover photo; inner picture panels; light blue spine and blue rear panel. Inside and inner picture panels. Track list on inside panels. Round holes in rear panel and barcode on rear panel. 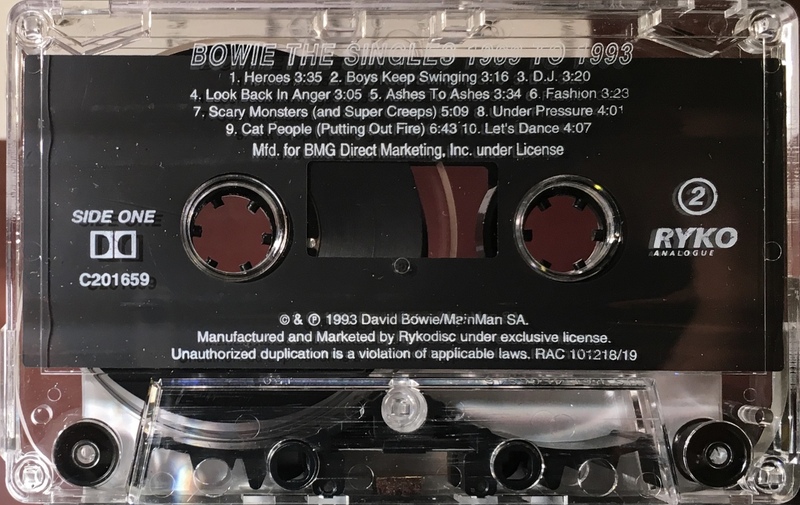 Side 1: Heroes; Boys Keep Swinging; DJ; Look Back In Anger; Ashes To Ashes; Fashion; Scary Monsters (and super creeps); Under Pressure; Cat People (Putting Out Fire); Let’s Dance. 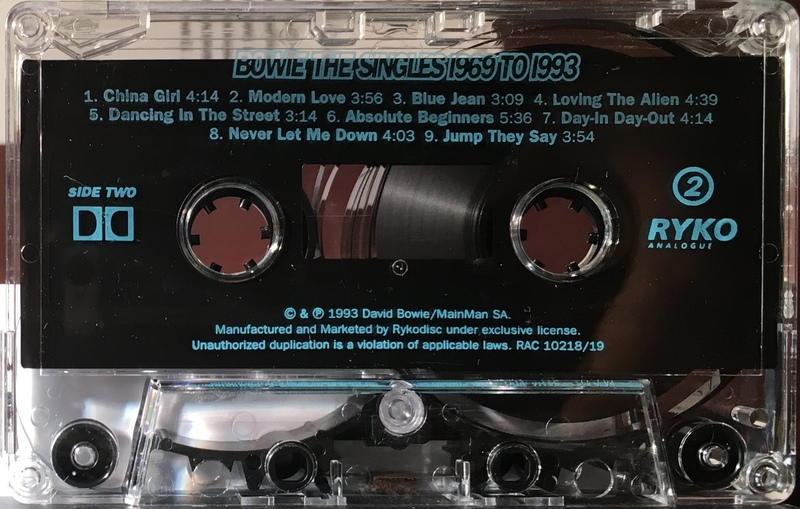 Side 2: China Girl; Modern Love; Blue Jean; Loving The Alien; Dancing In The Street; Absolute Beginners; Day-In Day-Out; Never Let Me Down; Jump They Say. 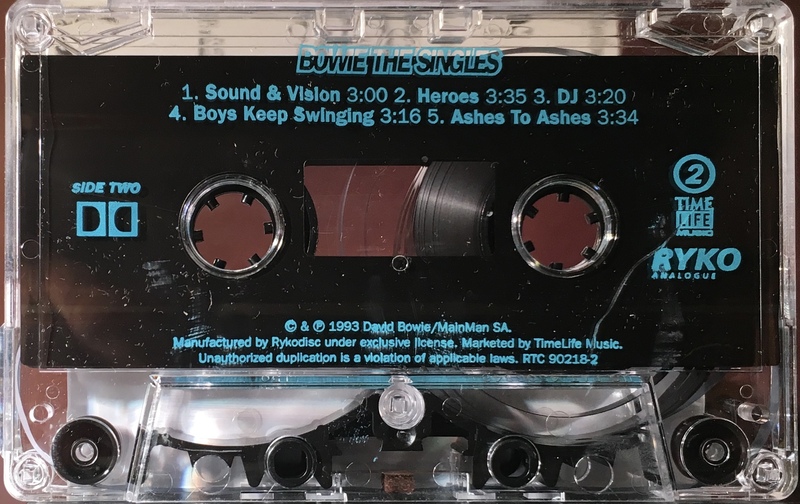 Advance promotional cassette of the double album also released as two separate cassettes. Single panel cover on red coloured light card Inside panels are blank. Track list on cover. 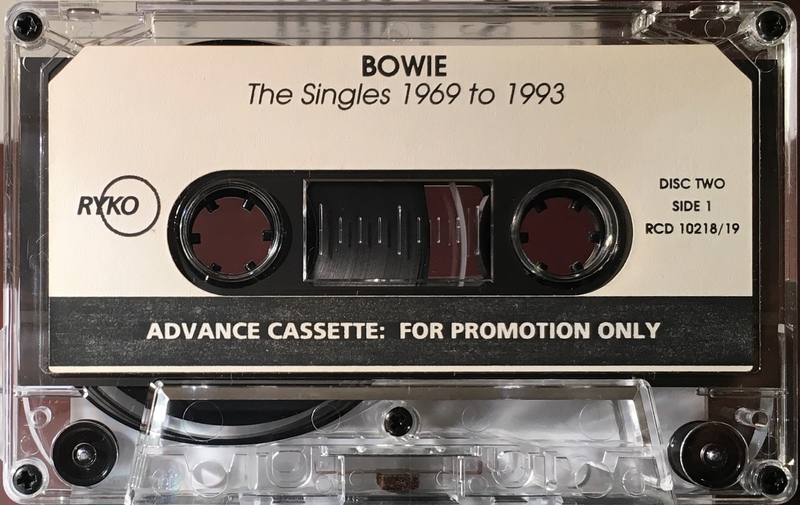 Black ink printed on white paper label with black bottom, onto clear shell; marked ‘Advance Cassette: For Promotion Only’. 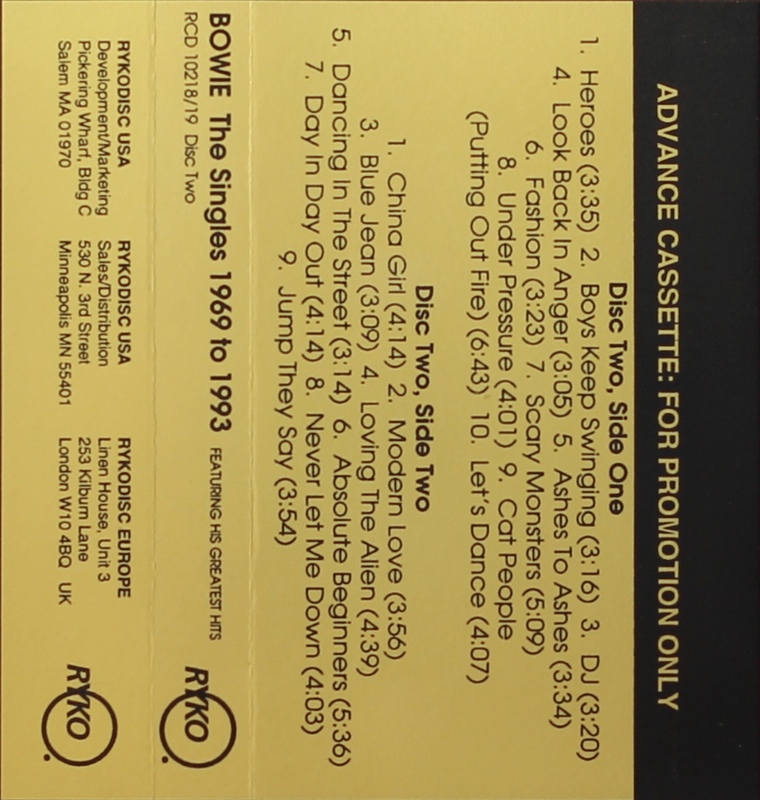 Advance promotional cassette of the double album also released as two separate cassettes. Single panel cover on yellow coloured light card Inside panels are blank. Track list on cover. 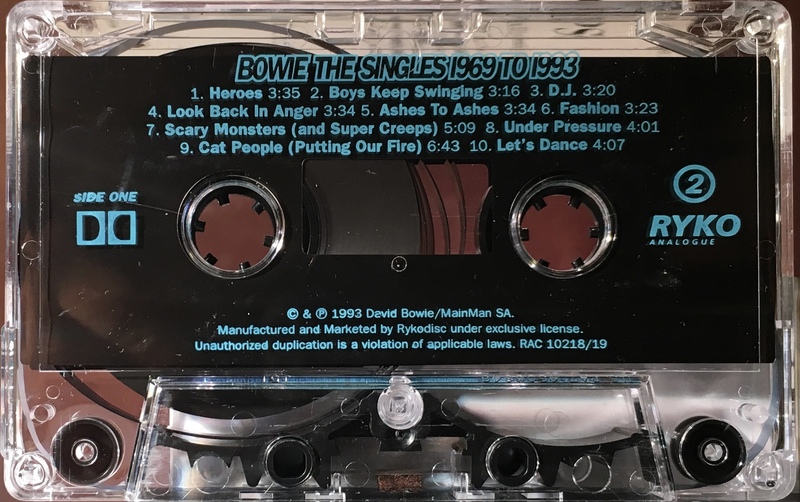 Side 1: Heroes; Boys Keep Swinging; DJ; Look Back In Anger; Ashes To Ashes; Fashion; Scary Monsters; Under Pressure; Cat People (Putting Out Fire); Let’s Dance. 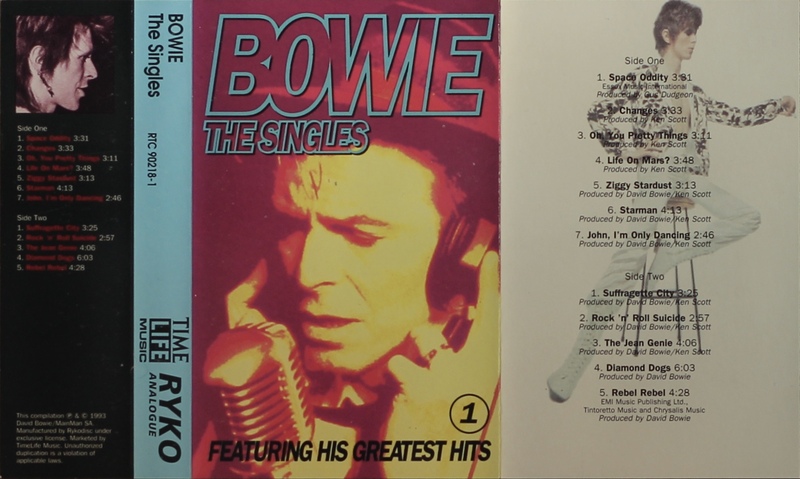 The Singles (1969 To 1993): USA; RYKO, C201659; 1993. 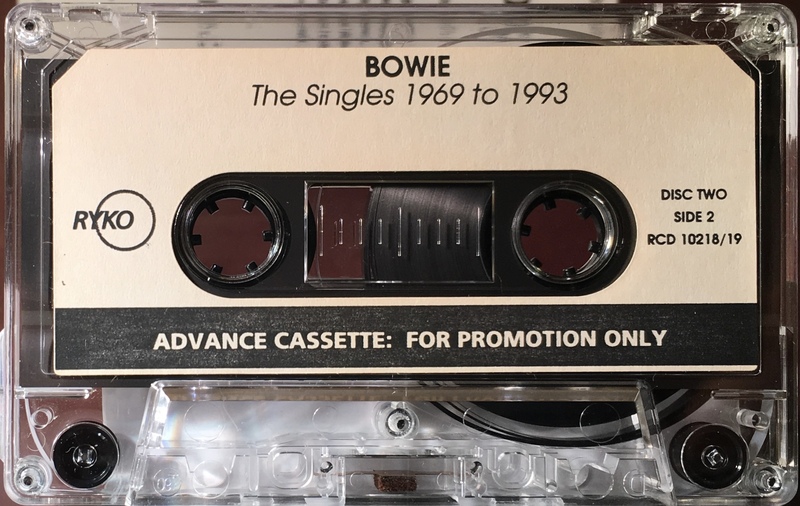 Double album released as two separate cassettes for BMG Direct Marketing (formerly RCA Music Service/ RCA Victor Record Club). Six panel cover on glossy, perforated paper with full panel cover photo; inner picture panels; light blue spine and blue rear panel. Inside and inner picture panels. Track list on inside panels. Round holes in rear panel. White ink printed directly to clear shell; plain slip sheet. Double album released as two separate cassettes. Six panel cover on glossy perforated paper with full panel cover photo; inner picture panels; light blue spine with both catalogue numbers on it and blue rear panel. Inside and inner picture panels. Track list on inside panels. Round holes in rear panel but no barcode as it was direct marketing via the record club. The Singles: USA; RYKO/ Time Life Music, RTC 90218-1; 1993. 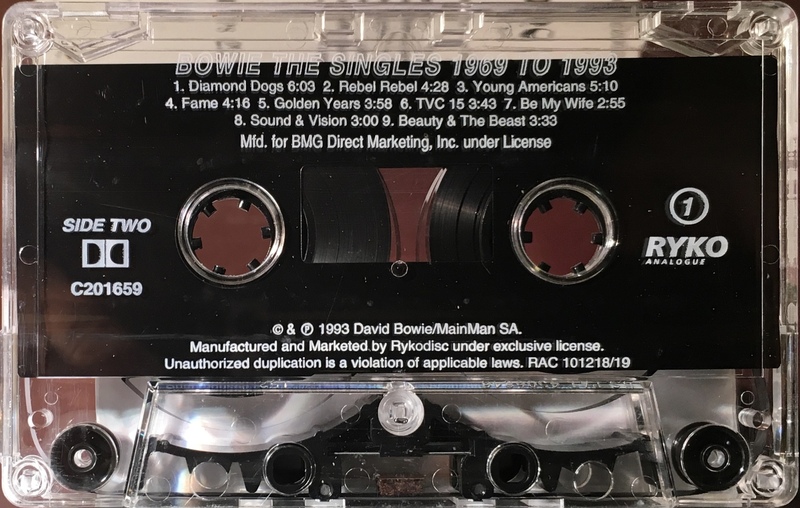 Double album released as three separate cassettes for direct marketing via Time Life Music, as with the non-USA releases the titles is just ‘The Singles’. 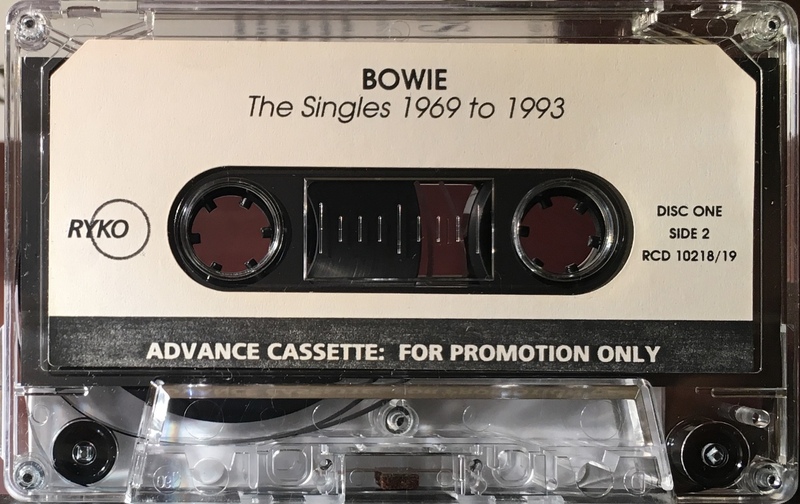 Despite being spread out over three cassettes there are less trans here than on the double cassette releases. Full panel cover photo on thick, glossy paper; inner picture panels; light blue spine and black rear panel. 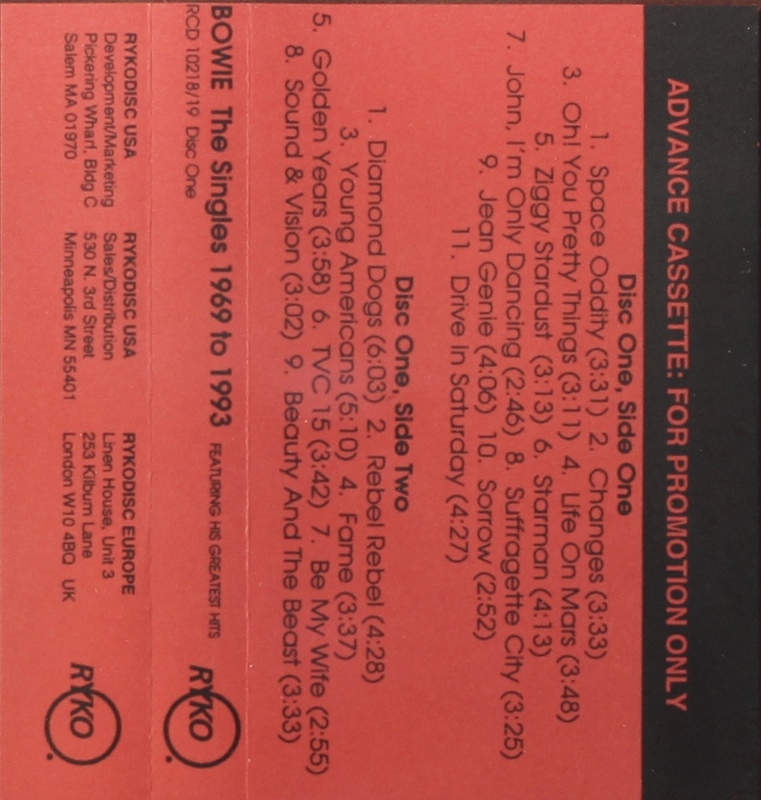 Track list on inner and rear panels. Blue ink printed directly to clear shell; plain slip sheet. RYKO and Time Life Music logos on shell. Side 1: Space Oddity; Changes; Oh! 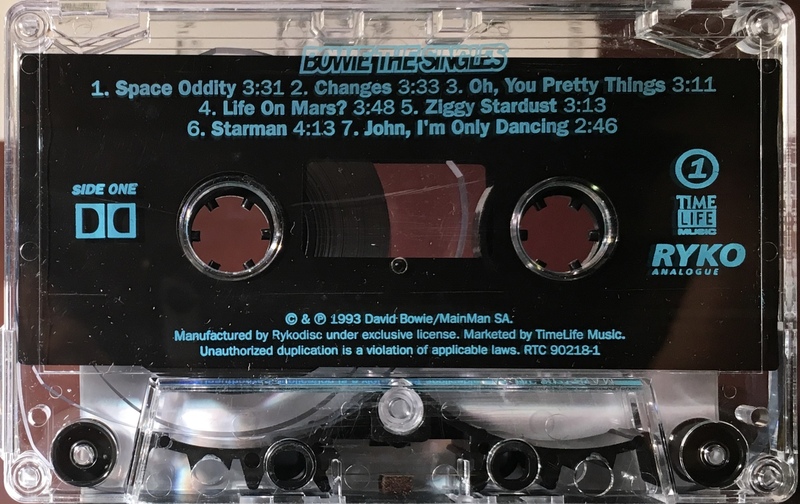 You Pretty Things; Life On Mars? 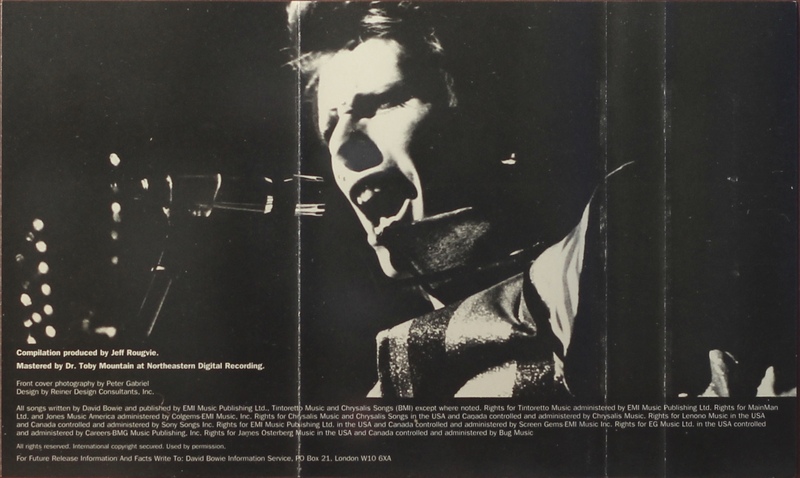 ; Ziggy Stardust; Starman; John I’m Only Dancing. 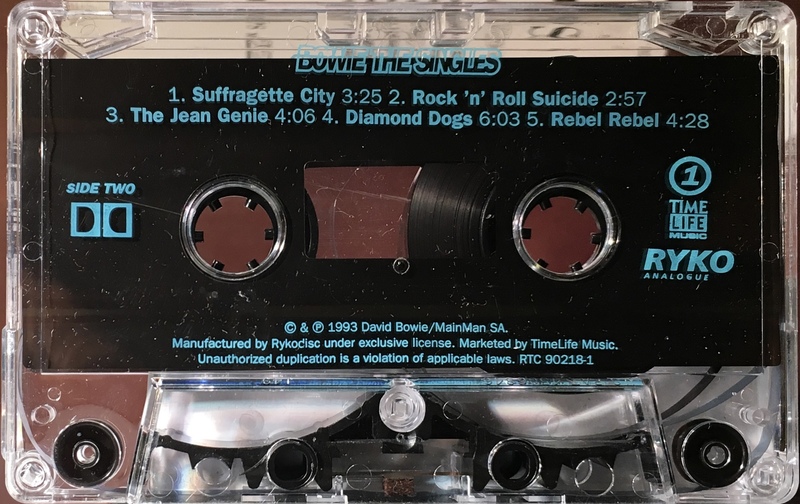 Side 2: Suffragette City; Rock ‘n’ Roll Suicide; The Jean Genie; Diamond Dogs; Rebel Rebel. 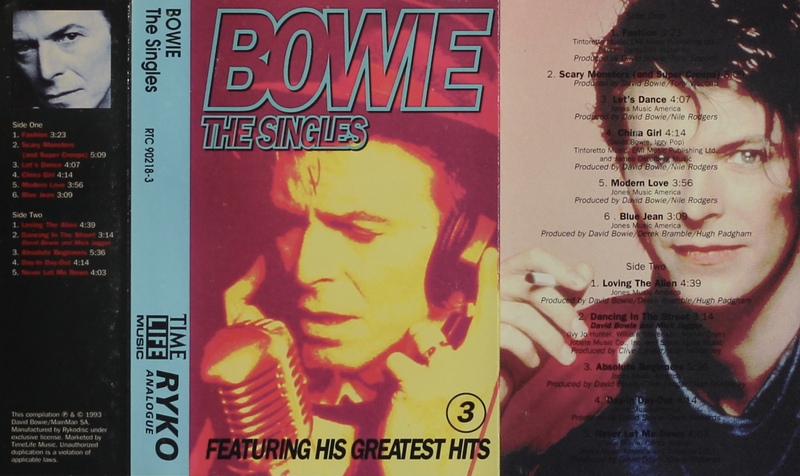 The Singles: USA; RYKO/ Time Life Music, RTC 90218-2; 1993. 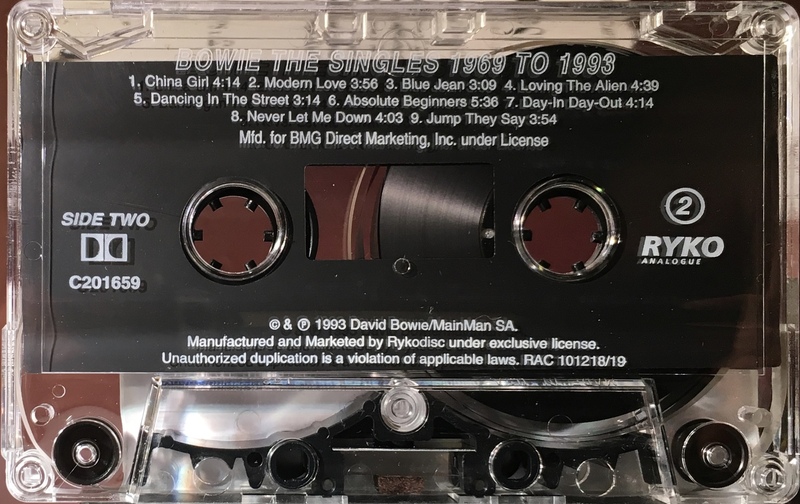 Double album released as three separate cassettes for direct marketing via Time Life Music, as with the non-USA releases the titles is just ‘The Singles’. 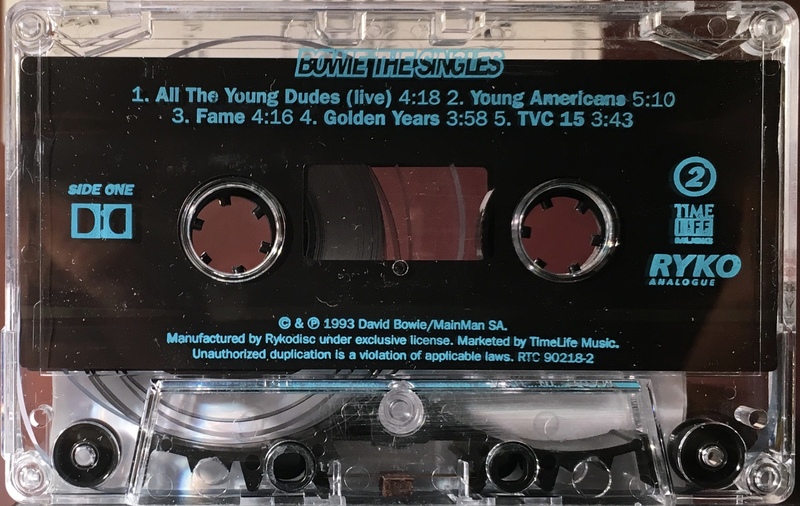 Side 1: All The Young Dudes (live); Young Americans; Fame; Golden Years; TVC 15. 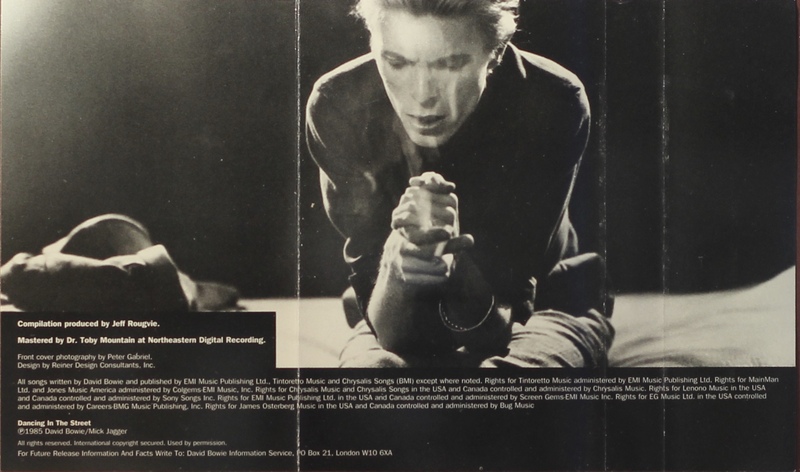 Side 2: Sound & Vision; Heroes; DJ; Boys Keep Swinging; Ashes To Ashes. The Singles: USA; RYKO/ Time Life Music, RTC 90218-3; 1993. 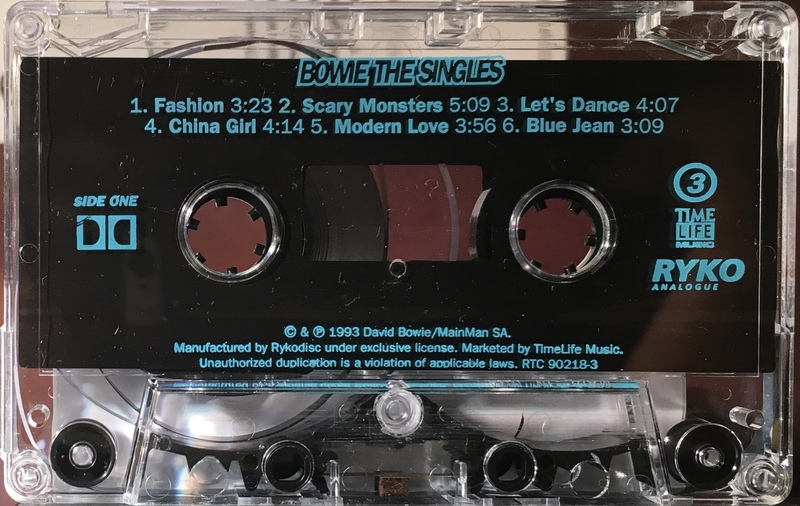 Side 1: Fashion; Scary Monsters (and super creeps); Let’s Dance; China Girl; Modern Love; Blue Jean. 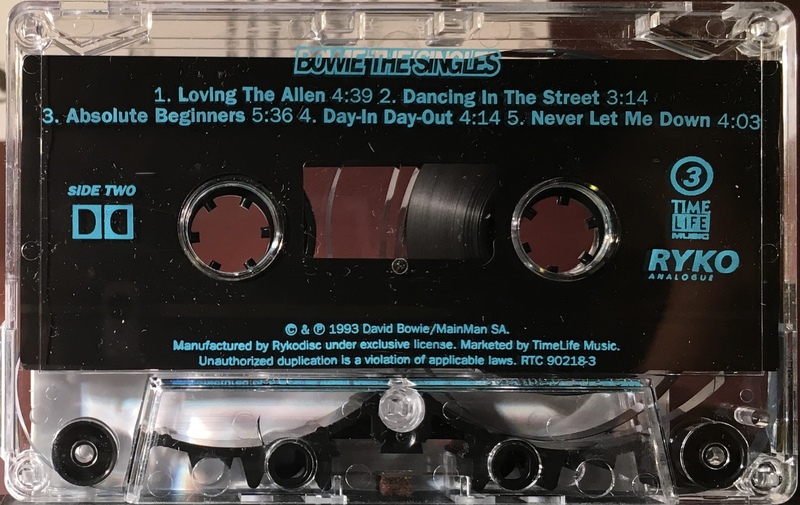 Side 2: Loving The Alien; Dancing In The Street; Absolute Beginners; Day-in Day-out; Never Let Me Down.